Security is improving in many parts of Afghanistan, but Marines still face danger every day. I’m not exactly breaking any ground with that statement for the Marines, friends and families who read this blog, but it’s still worth observing in poignant ways when possible. The Associated Press released a series of photographs over the weekend of Marines being medically evacuated from in and around Sangin, Afghanistan. Their photographer was embedded with the Army’s Task Force Lift “Dust Off,” Charlie Company, and braved enemy fire that hit the helicopter during one of the evacuations. What follows are images of Lance Cpl. Blas Trevino and Lance Cpl. David Richvaslky of 1st Battalion, 5th Marines, out of Camp Pendleton, Calif. They’re photos are tough to look at, but show the care wounded Marines receive on the battlefield. The helicopter crew needed to attempt landing twice to evacuate Trevino from a hot landing zone, and took five rounds in the aircraft’s tail, the AP reported. I wrestled a bit with how to appropriately publish these images. Much like with Cpl. Jorge Villarreal, it seemed like the only fair thing to do was publish them respectfully. 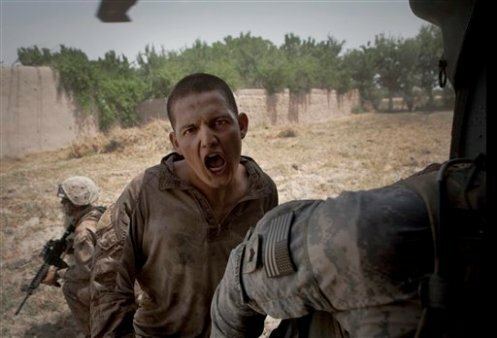 There’s no gore here, but the emotions on these Marines’ faces say it all. Nice work, yes, respectfully done and so moving. Very good job…again…with your sensitivity regarding wanting to post the photos in a respectful manner. Take care my brother. We will see you soon! My son was with B 1/5 and wounded on 5/22/11. Lance Cpl Trevino was one of the guys who helped carry him to the CH-47 while they were under fire. Found that out recently. Our prayers go out to Trevino and his family for his quick recovery. My son is still recovering, having just had his last surgery several weeks ago. Semper Fi!